Hi! 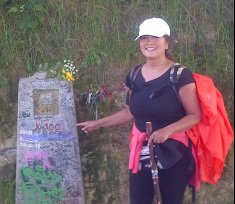 I'm Yaz Rooney, a 2013 pilgrim of the thousand year old sacred road to Santiago. If you have heard the mystical call of the Camino de Santiago (The Way of St. James, or simply The Way), and are looking for information that will help you prepare physically, mentally and spiritually for the journey ahead, then you have come to the right place! Between May and June 2013, I walked the 806 km journey from St. Jean Pied de Port to Santiago de Compostela. It was one of the most physically and emotionally challenging adventures of my life, and a deeply transformational experience. The reverberations will be felt for the rest of my days in this world. Once you have completed your pilgrimage to Santiago de Compostela, you will understand my deeper motivations for setting up this website. The camino enters the heart and soul of the pilgrim who walks The Way, bringing a sense of unspeakable joy and re-connection to something deep within that cannot be defined with words. With this re-connection comes an inexplicable longing for the more profound expressions of life, and this inspires many people to make repeated pilgrimages to Santiago. There are numerous routes from Spain, France and Portugal, and pilgrims have been known to cover practically all of them. Some do things differently. They return to various parts of the camino route to serve other pilgrims in whatever way they can. Still others write books about it, or they write blogs and articles. Many join forums that connect them to fellow pilgrims. We all need to talk, to share, to dare to try to express what is ultimately inexpressible. I am a writer with a mystical heart, and through this site, I try to share the gifts that the camino has given me. I offer practical information that deals with the purely physical aspects of the journey. It is not an easy trip for many, and there are a lot of things that need to be taken into consideration before leaving. I offer articles for those who search for something deeper. I share the secrets of my soul, giving you a glimpse of the wonder that the sacred road to Santiago has to offer. I hope you enjoy this site and all the others that I provide links for. I wish you all the best on your journey. It all starts with the call, then follows the preparation and the excited anticipation. Let it all start here, and I promise to do everything that I can to help make your journey a good one! Everything a pilgrim needs to know about walking the camino.